After Action Report 4th Infantry Division, November 1944. The 4th Infantry Division launched a coordinated attack to the northeast beginning at 1245 in the direction of Düren with three regimental combat teams abreast and prior to 1800, had succeeded in advancing through heavily woooded terrain approximately 1500 meters. The 8th Infantry with Company A, 4th Medical Battalion; one platoon, Company A, 4th Engineer Combat Battalion; Company D, less one platoon, one Platoon, Company A, and an Assault Gun Platoon, 70th Tank Battalion , and one Platoon, Company A, 803d Tank Destroyer Battalion (SP), attached, began movement at 0830 with the 2nd Battalion and relieved Company F, 47th Infantry Regiment at 0955. The 1st Battalion moved forward to occupy the positions previously occupied by the 2nd Battalion at 0830 and closed at 1050. The attack was preceded by an aerial bombardment at 1115 and H-Hour was set for 1245. The 2nd Battalion jumped off folllowing the artillery preparation and under heavy mortar fire, advanced slowly, two companies abreast, Companies F on the left and G on the right, until they reached F-017417 where they were held up by a band of triple concertina wire covered by small arms and mortar fires. Due to the failure of the Bangalore torpedoes to function, the battalion was ordered to prepare its defenses for the night. At 1355 the 1st Battalion received orders to move two companies forward to a hill in the vicinity of F-009414 previously occupied by two assault companies of the 2nd Battalion and the 3d Battalion to echelon forward at 1408. This attack was intiated at 1540 but had to be terminated by 1625 and coordination effected for the night. The 12th Infentry, with Company B, 4th Medical Battalion; one platoon, Company B, 4th Engineer Combat Battalion; Company B, less one platoon, 803d Tank Destroyer Battalion (SP), one platoon, Compary C, 87th Chemical Battalion; Company B, 70th Tank Battalion, and 4th Reconaissance Troop (Mechanised), attached. The 2nd Battalion, 12th Infantry, left its assembly area at 1145 and together with the 3rd Battalion attacked one hour later. Small arms, mortar, machine gun and artillery fires were received immediately and the advances of both battalions were impeded by extensive mine fields. Heavy opposition continued throughout the period. Company L, having been heavily shelled with mortar fire, company commander killed, and a large number of booby traps encountered, was forced back to its line of departure by 1554. In the interim the 2d Battalion successfully negotiated the minefield confronting it and continued its advance to within 400 yards of its objective. The close of the period found the 3d Battalion still in the vicinity of its line of departure. The 22d Infantry, with Company C, 4th Medical Battalion; Company C, and one Platoon, Company D, 70th Tank Battalion; one Platoon, Company C , 4th Engineer Combat Battalion; Company C, less one Platoon, 87th Chemical Battalion, and one Platoon, Company C, 803d Tank Destroyer Battalion (SP), attached, attacked at 1245 and the main opposition encountered was in the form of heavy mortar concentrations but only scattered opposition from small arms arms, machine gun, and artillery fires, and prior to the finish of the day's operations, considerable gains had been made over rough terrain. While the three Regimental Combat Teams were attacking, the 24th Cavalry Reconnaissance Squadron, less one troop, relieved the 296th Engineer Combat Battalion on various road blocks in the division sector with the exception of these in the 8th Infantry zone of action which were still under heavy machine gun fire. The 4th Infantry Division continued its attack to the northeast beginning at 0800 with three Regimental Combat Teamsabreast and succeeded in securing importatnt terrain features within its zone of action. The 8th Infantry, with the same attachments as mentioned for the previous day, attacked in a column of battalions at 0800 with the 2nd Battalion in the assault. Due to the heavy mortar fires received at H-Hour, and the heavy casualties suffered in the previous day's operations, this battalion was unable to advance beyond the concertina wire previously mentioned. An attack by the 1st Battalion to their immediate front through the 2d Battalion sector was ordered for 1015 but was never initiated. Before the troops could begin passing through the gap, the enemy launched a counterattack up the draw in the vicinity of F-020410 on the right rear of Company A. This attack was repulsed and fifteen prisoners taken. The 1st Battalion was ordered to consolidate on its old position for the night. The 3d Battalion had remainded in previous positions throughout the day. in a muddy field amid the Hürtgen Forest on November 17, 1944. The 12th Infrantry, with the same attachments as mentioned for the previous day, attacked with the 2nd Battalion at 0840 and shortly encountered machine gun fire covering the mine fields. Work was continued under fire with an effort to clear the mines and booby traps in their paths of advance while numerous patrols sought alternate routes. Mortar and artillery fires were continues and when the day's operartions were finished, no gains were in evidence. The 22nd Infantry, with the same attachments as mentioned for the previous day, was subjected during the early hours of the morning to extremely heavy artillery concentrations, casualties included the 1st and 3rd Battalions' commanders. This resulted in a delay but the attack was initiated at 0945 against heavy mortar, machine gun and small arms fire. 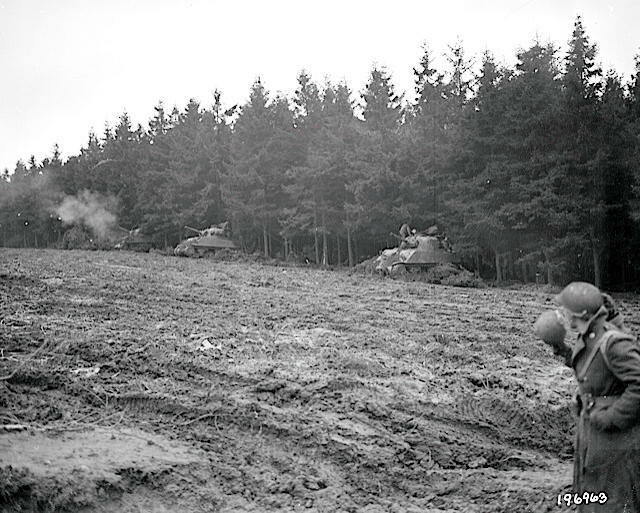 Of the armor supporting this battalion (one platoon of light tanks), two were knocked out by mines and those remaining were unable to proceed because of the denseness of the woods. However, by 1300, the 3rd Battalion had advanced to the vicinity of F-015388 and had formed a defensive flank to the north. At this time, the 1st and 2nd Battalions were again ordered to attack. The virtually impassable terrain and the enemy infiltration in the rear of the 2nd Battalion hampered the advance and after reaching dominating position on the main north-south road, the advance was halted and positions consolidated for the night.